Nutrition is what makes or breaks a diet. We need to think of our bodies as a car that we have to fuel to keep moving on a day to day basis. Right?! So what we put into our bodies everyday can cause us to lose weight, gain weight or maintain. People like me (those hard headed, stubborn people) KNOW this concept. It’s nothing new to us. However, for some reason, it’s hard to win. I’ve said it a million times, but I’m a healthy eater, but I eat out a lot. Along with eating out comes excess sodium and bloating, which is not a girls friend when it comes time for a morning weigh in. Feel me? One evening a few months ago, I met one of my dearest friends for sushi and we discussed food for about 2 hours while we waited on the slowest waitress in the history of waitresses, who brought us the wrong, cold food. Anyways. She was telling me about different types of dinners and lunches she was fixing for herself and I was intrigued. They weren’t that difficult and honestly, I feel a little crazy for not knowing to put these foods together in the first place. I guess if I don’t see it completed, or read it on a recipe, I have no clue what I’m doing. I wanted to share a few of my favorites (and yes, some of the recipes I received from my friend as well) from the past few weeks. I will also post the recipe to the foods I’ve made at home so that people like me can look at it and think “sweet mother, that’s easy, why didn’t I think of that!” I’m also including my fast food go-to’s, because …. well, sorry. First up-Breakfast! Did you know Chick Fil A has multi-grain oatmeal? Did you know that you can get this oatmeal with a side of scrambled eggs? Oatmeal with a 1/2 teaspoon brown sugar cinnamon topping (155 calories) 1 scrambled egg (90 calories) BOOM….perfect breakfast! 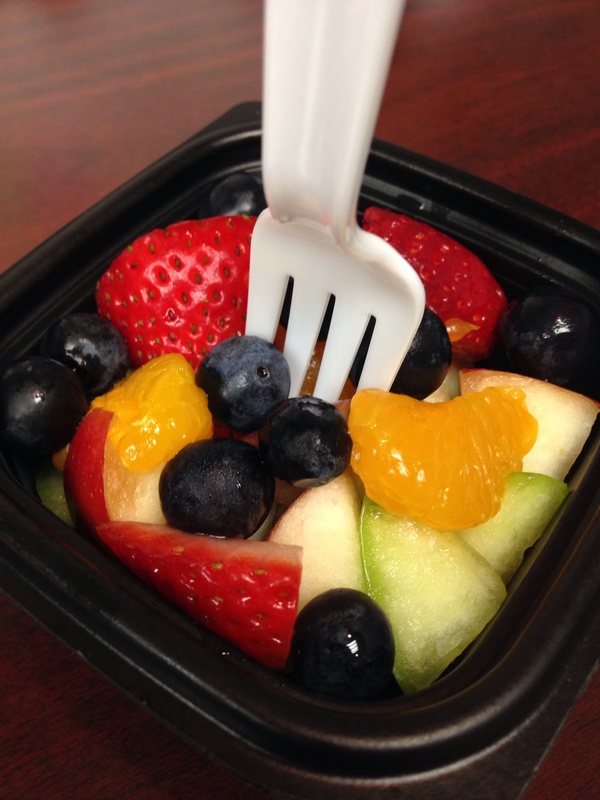 Add a medium fruit cup for your 10AM snack for an additional 50 calories. Lunch…the meal my body hates me for when I finally do get around to eating. I should be eating no less than 5 times a day, small meals, snacks etc. 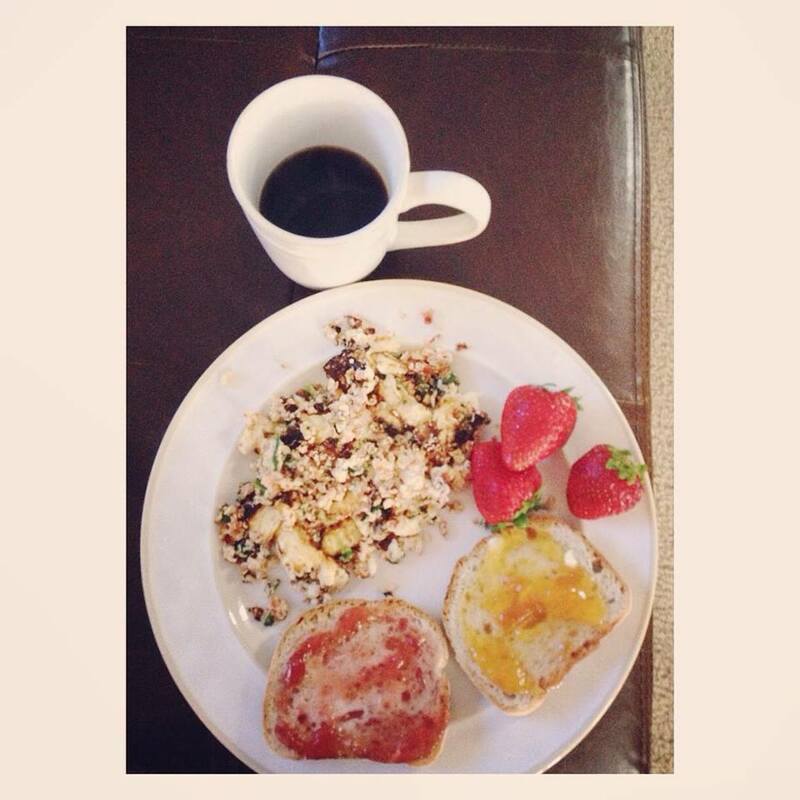 I always start awesome by eating a great breakfast, then I find myself starving around 11. Some days I will snack on almonds, or a cheese stick, but more days than not, I hold out until after 1 for lunch. Basically I’m starving and would eat a hippo (not really) by the time I finally sit down to eat lunch. Obviously this leads to bad, misled, fast choices, which are not thought through like they should be. Eating out at lunch time consists of one basic restaurant, Chick Fil A. And one basic meal, the grilled chicken cobb salad with no crispy red peppers (use your 80 calories else where, like a kids dish of Ice Dream…) and a half portion of the fat free honey mustard dressing. Sometimes with a cookie. I’m sorry, I can’t help myself. Sometimes it’s necessary. When I come home for lunch, I usually rock out some good choices though! Shakeology is a new option I’ve picked up over the past 2 months. I don’t drink it every day, but when I do, I use 2 tablespoons PB2, 3/4 c unsweetened vanilla almond milk and half a banana. I also bought some cold brew 80 calorie cafe latte to use with it this weekend! Excited to try some new blends! If I am home, and don’t choose Shakeology, then I usually eat salads or whatever I can find in the fridge for less than 300 calories. Tuna Salad! 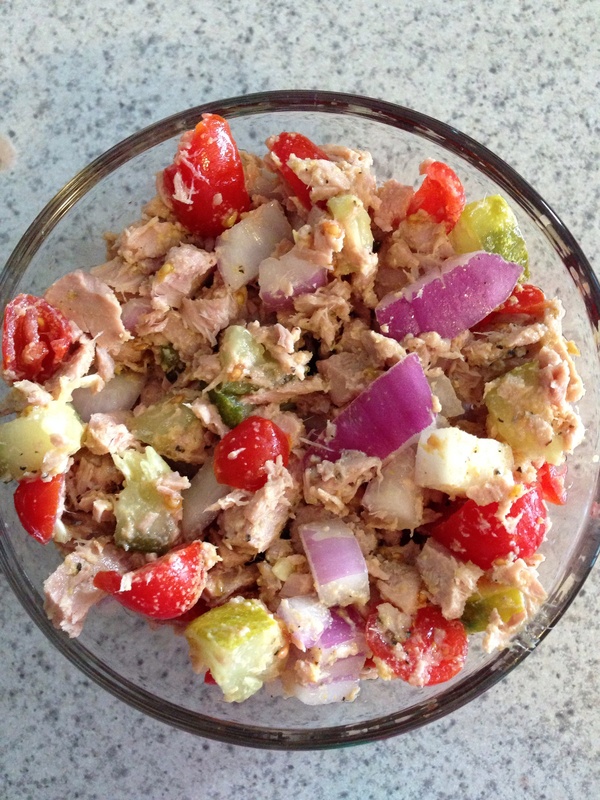 1 can of Wild Planet 100% pole caught tuna (I get this at Meijer), 1 half slice Claussen dill pickle, 1 small handful diced red onion, about 10 cherry tomatoes cut in half, 1/2 teaspoon of olive oil, a pinch of salt and about 2 teaspoons of stone ground mustard. SO. GOOD. I. CAN’T. EVEN. TELL. YOU. HOW. GOOD! I eat this straight out of the bowl or on a piece of Udi’s GF multi-grain bread that has been toasted. 2-4 chicken breasts frozen, 1/2 c water, 1/2 c organic chicken broth, poultry seasoning, garlic powder and pepper to taste (I use about 1-1.5 teaspoons of the poultry seasoning, 1 teaspoon of garlic powder and a few shakes of pepper.) Let sit for 8 hours on low and shred when done. It’s basically the perfect flavor. We’ve made it twice and once left it as-is and once added BBQ. So good. I tell ya, my friend is a wicked genius! This –shockingly enough, is one of my own concoctions, and it couldn’t be any easier. 4 chicken breasts, frozen, 1 bag of frozen tri color peppers (I use Kroger brand), 1 packet of low sodium fajita mix, 1 can of organic black beans. Let set for 8 hours on low. Stir it all together when done and use on top of low carb, whole wheat tortillas or Food Should Taste Good blue organic tortilla chips. Like I had mentioned last week, we lost our dog and we did not find him until last Wednesday and we had lost him the previous Thursday morning, so basically the past 2 weeks I’ve had a hard time concentrating because of the stress of losing him and a few other things. Kinda sounds like an excuse though, I get that. So this week I’ve started my Monday off trying to make a few healthier changes. 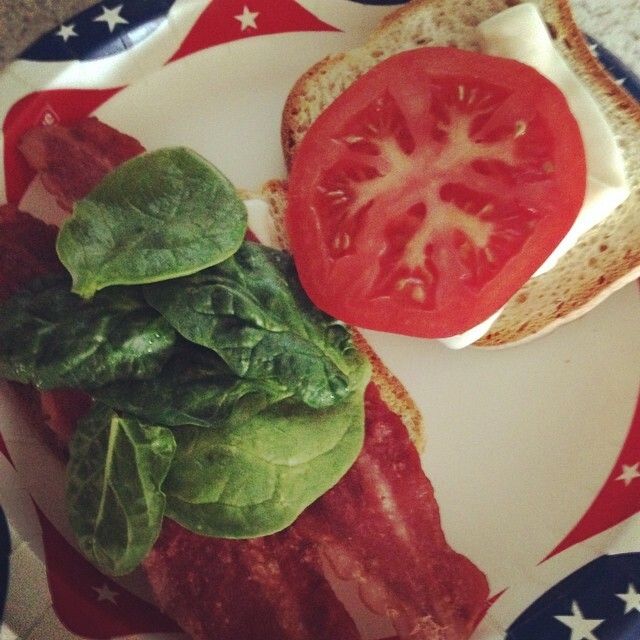 5-6 glasses of water today so far and a healthy version BLT for dinner. Squats while I dry my hair in the morning and I’m getting ready to jump on the recumbent bike for a half hour. Small. Steps. What have you done this week? Made any changes for the better?